Aomaso 42000mAh External Battery, more powerful but more compact form factor. Polymer battery: After 24 months, still over 80% of total capacity. 3 USB ports (2.1A, 1A and smart detect) to allow for top-speed multiple device charges. 3 USB also compatible with almost any smart device with an input of DC 5V. Blue LED indicator helps you easily know the charging status and battery level. The led flashlight can switch to 3 modes, Emergency mode, highlight mode, average light mode. Especially design for outdoor activities like camping, mountain climbing, picnics and Mobile games! -To ensure complete safety and best performance, we strongly recommend using your device's original cable, a third-party certified cable (such as MFI) or our included cable. A real power monster is here, 42000mah polymer cell weighs only about 800g, prepared to meet all your needs in digital life at home, in your car, on your trip and for your Mobile games. 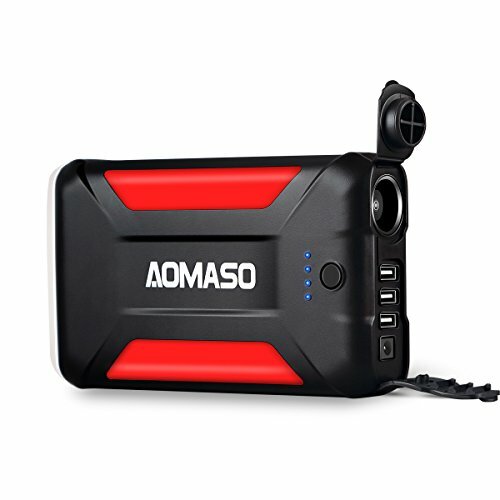 Aomaso 42000mAh energy station has 3 USB input and 1 Cigar lighter output. 3 USB ports are 5V/2.1A, 5V/1A and auto detected that offers best charges per your device. Cigar lither out put is DC 12V/15A for car chargers. All numbers are printed on the long lasting silicon cover which is to block water and dust. Just plug in the right USB output by your device. If you don't know what Amp your device is please use the Smart Out1 which automatically detects your device currency. As the lighter output is separately structured we can use the four ports at the same time. No need to find the power off button as it shuts off automatically after seconds idle. Bright LED means you have equipped a reliable lamp and an emergency alert at night and/or outdoors. Please regard to the user manual to get the full instruction. Military level and design provides best feel and experience that may overturn your impression on external batteries. If you have any questions about this product by Aomaso, contact us by completing and submitting the form below. If you are looking for a specif part number, please include it with your message.